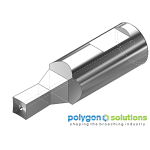 Square Rotary Broach Tools by Polygon Solutions. We manufacture precision square rotary broach tools at our facility in Fort Myers, Florida, USA. Most standard size square rotary broaches are shipped same day when ordered by 4:30PM EST. Please choose the desired shank size below to see our square rotary broach tools. Our square broaches are available with a 1/2″ shank diameter x 1-3/4″ overall length, 8mm shank diameter x 1-1/4″ overall length or 8mm shank diameter x 28mm overall length. 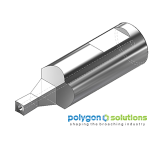 Polygon Solutions’ square rotary broaches are precision ground with a tolerance of +0/-.0005. 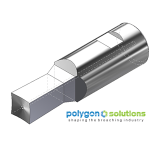 Each nominal size conforms to the industry standard – ANSI B18.3 2003. All square rotary broaches can be made from M-2, PM M-4, PM T-15 or M-42. For rotary broaching tougher material or longer tool life, coatings such as TiN, TiCN, TiAlN or Punch Coating can be added to any square rotary broach.